Lock in a great price for Holiday Inn Amsterdam - Arena Towers – rated 8.2 by recent guests! IT WAS GOOD OVERALL BUT THE BREAKFAST EXPERIENCE WITH THE STAFF NOT VERY GOOD AND NOT AS PER THE FOUR STAR HOTEL. The windows, the bathroom and the whole room actually. The bed was OK. Excellent, friendly and professional staff. Delicious breakfast, convenient location and spotless when it comes to cleaning. Friendly staff hats off to Housekeeper she kept room Clean and always had towels great job! Room was well appointed, comfortable pillows and bed. Holiday Inn Amsterdam - Arena Towers This rating is a reflection of how the property compares to the industry standard when it comes to price, facilities and services available. It's based on a self-evaluation by the property. Use this rating to help choose your stay! The 4-star Holiday Inn Amsterdam Arena Towers is located in the center of Amsterdam Southeast, the most dynamic entertainment area of Amsterdam. It offers free WiFi throughout the entire hotel and modern guest rooms with a personal pillow menu. Each room includes an LCD TV with international channels, free tea/coffee facilities and a mini-bar. The private bathroom is fitted with a walk-in shower. The hotel's Open Lobby restaurant offers an all day dining experience where you can eat, drink, work, meet, relax and socialize. It serves a varied menu made with high quality ingredients. You can also grab something from the To Go Café that serves Starbucks products, or order in from the 24-hour room service. The Healthy Start breakfast buffet includes several kinds of bread, cheeses, meats, boiled eggs, vegetables and fruit juices. A dairy breakfast is also available providing cereals and yogurt. Coffee and tea are included. You can park your car at one of the 450 parking spots offered at Holiday Inn Amsterdam - Arena Towers at a surcharge. This hotel combines another neighboring 3-star rating Holiday Inn Express Amsterdam Arena Towers with 323 rooms. AFAS Live is 1,650 feet away, while Ziggo Dome is 2,300 feet. Johan Cruijf Arena and the IMAX theater are both 1,950 feet. A wide variety of shops and restaurants can be found a short walk away from the property. The train and metro station is only 2,150 feet with direct links to Central station in 15 minutes. Schiphol Airport is a 10-minute drive away. When would you like to stay at Holiday Inn Amsterdam - Arena Towers? This room has modern decor and comes with free Wi-Fi, LCD TV, climate control, spacious work desk and soundproof windows. There is also a minibar, tea/coffee facilities and a personal pillow menu. The bathroom is fitted with a walk-in shower. Please note that the bed type preference will be confirmed upon arrival. Public parking is available on site (reservation is not needed) and costs EUR 3 per hour. This spacious Executive Double room has free Wi-Fi, LCD TV, climate control. spacious work desk, soundproof windows and tea/coffee facilities. There is also a minibar, personal pillow menu, a walk-in shower and a separate bathtub. Explorers, music- and sportfans Welcome! Holiday Inn Amsterdam - Arena Towers is the perfect match for your stay in Amsterdam. Located in the most vibrant business and entertainment area of Amsterdam, on walk distance of Amsterdam ArenA football stadium and concert halls Ziggo Dome and Heineken Music Hall. 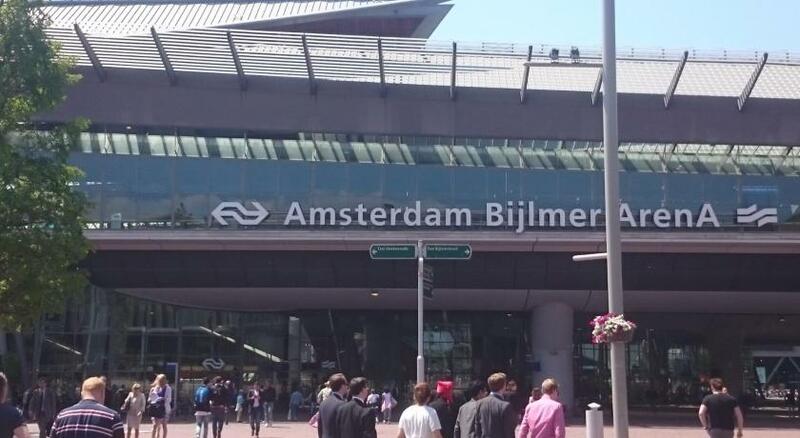 Take the metro or train from Bijlmer ArenA Station which takes you to central station in only 15 minutes. The city is yours to explore! Relax and enjoy lunch, dinner or a nice cup of Starbucks Coffee at The Open Lobby of our hotel. This living room really invites you the feel home. House Rules Holiday Inn Amsterdam - Arena Towers takes special requests – add in the next step! ATM card Holiday Inn Amsterdam - Arena Towers accepts these cards and reserves the right to temporarily hold an amount prior to arrival. Holiday Inn Amsterdam - Arena Towers accepts these cards and reserves the right to temporarily hold an amount prior to arrival. Please note that the hotel will pre-authorize your credit card upon arrival (the amount depends on the length of stay). If using the same credit card to pay the final bill, the pre-authorized amount will be released from the original card within 7 days. Your bed type preference depends on availability and cannot be guaranteed. An extra bed/children's crib is only possible upon request and is subject to availability. Room telephone didn’t work and had to go down to reception to order for room service and then was asked to go to the first floor to do so. Choice in the bar. Breakfast. The very friendly, bit older man, who worked at breakfast. Coffee and tea cups were not clean. The restaurant is terrible. High prices but feels like eating at Ikea. Very loud and not very cosy. Nice modern room. Staff at check-in were nice. The Breakfast team was horrible in their way of handling the guest request. Their reception by asking you like a security guard and then behaving like they are offering you some special by favor by actually doing their duty was surprising. Non professional attitude was visible in nearly most of the staff in the breakfast restaurant. It seems the captain has made the system like it and not bothered that the guests are asking for the services for which they have paid and not the charity. Their blunt reply to not to offer Omlette in four star Hotel was a huge surprise. Actually, my last stay at three star HOLIDAY express beside was more smoother and comfortable than this four star stay. The check Incas good and staff at front desk good. I did not like the Breakfast control by the staff as it is four star property and the Breakfast seemed controlled by the staff for their own reasons. We were not served the Omlette as per our request because of some strange reasons of the staff. I think this is not at all good for the four star Hotel. Roomservice was closed after 12, breakfast buffet could be more diverse. Especially some halal products would be nice! The hotel is exactly what we expected from a modern Holiday Inn: good location, attentive staff, clean and functional: absolutely fine. Parking in front of the door (kind of expensive but convenient) Staff were very friendly and helpful. The restaurant was pretty good. We didn't get double bed room we asked for, lights in the room didn't work properly, refrigerator didn't work, stream of water in the shower was very low, etc.